Henry Okah ! The dilemma of a Niger Delta activist! From gun running to freedom fighting! CONGRATULATIONS, sir, on your turning 70 years. That is the biblical three score and 10. How does it feel getting there? Well, I feel fine and I thank God for that. And I want to use this occasion to thank all the Nigerians and foreigners that turned up in very large numbers at the three events that marked my birthday. I am deeply humbled and most grateful for that event turning out to be a national one. I think I ought to use this medium also to thank the media, in particular The Guardian, for giving a posthumous coverage to an event that took place when you were not in print. For that, I am very grateful. The conventional wisdom is that any single day after 70 is a bonus and I accept that completely. So, I look forward to full retirement, namely, going to the next life whenever it comes. I have had a very full, very fulfilled life, professionally, family-wise and in business; I am a very fulfilled man. And for that, I am very grateful. Your birthday lecture at the NIIA was a massive event. Many prominent Nigerians including the President attended or sent representatives. Most able Generals produced by this country, who are still alive, were there except your good friend, former President Olusegun Obasanjo. Why? I didn't invite him and I don't know what I would have done if he came un-invited. I would probably have called the police to throw him out. Obasanjo is the most toxic leader that Nigeria has produced so far. A country that took him out from jail and made him a president; he abused Nigeria, he deceived Nigeria and he deserves a second term in prison and we will make sure he ends up there. I can prove it. Where is the so-called Abacha loot? The PTDF (Petrol Technology Development Fund) - Obasanjo was helping himself from it but he was reckless to accuse Atiku (Abubakar, Vice President under Obasanjo) of doing so. In the end, he entangled himself and became the accused. The records are there and if independent auditors audit the PTDF accounts, they would find that, that so-called exoneration that took place in the Senate is false. The NNPC and the oil industry - the amount of money the country lost as a result of Obasanjo's excesses and also the importation of petroleum products; the failure and the inability of government to maintain and repair our refineries, which gave rise to continuous importation of finished products. The amount of losses, which Nigeria incurred and sustained in the eight years of Obasanjo government - all of them, most probably, deliberately created. If we took an audit of the NNPC, we would find that Obasanjo qualifies for a second term in Yola or Maiduguri prison because the mosquitoes are bigger. The man is shameless. He has moved from Abuja to Ota as a result of his tenure, but he had installed himself as a puppeteer from where he still wields power. When Third Term (campaign for elongation of Obasanjo's tenure) died, Nigerians jubilated. People danced in the streets and everybody was happy, throughout the six zones of Nigeria, including, in fact, I should bring especially his own Southwest. Everybody was happy. We thought we had killed third term. But what is the result today? Right now, we are in Third Term with Obasanjo in Ota. 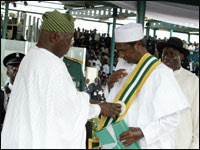 (Alhaji Umar) Yar'Adua, a harmless but spineless president in Abuja is counselled by the Aremu of Ota. So, the jubilation that marked the failure of Third Term has now been misplaced. The man that he installed - and he made a good choice - is a puppet. Obasanjo got a puppet that he wanted to his tune. Last week, the papers reported Yar'Adua calling Aremu of Ota his leader. We should all hold our heads in shame. Obasanjo served as president for eight years. He, in his wisdom, decided that it is now the turn of the North. But what is on the ground now is that the man who did so much harm to the economy, to democracy, who, during his time, was an absolute ruler of the country in a democracy, is still in charge. He kept to himself absolute power to run the country. Obasanjo subordinated the political party to himself throughout his tenure when he was the executive. Now that he has moved to Ota, he is subordinating the executive, the puppet that he installed in Abuja to the party with him as the chairman of the Board of Trustees, which office he has manipulated to make himself a life president. So, we have a gerontocratic chairman of Board of Trustees in the pixy of Robert Mugabes of this world. That is the class that Obasanjo belongs to: people who refuse to leave office, who have so soiled the seat on which they sat while holding political office that they are afraid to leave the seat. The tragedy of the Nigerian situation is that the political elite tolerates Obasanjo. You were in 1999 quoted as saying you would go on exile if Obasanjo were not elected president. What has happened; does it mean you didn't know him? Obasanjo and I come from a very long way. Not many people know about this. I judge people by their antecedents. It is a weakness but it is also my strong point. If I see a man introducing himself, I'd say, "who are you; what have you done in life?" I listen to you and keep my eyes wide open and watch you and I'll judge you by how you perform, but also what you have done in the past. The first time that Obasanjo, as an individual, drew my attention to himself and impressed me tremendously was during the Civil War. 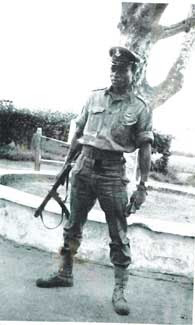 You know by about October/November 1969, towards the end of the Civil War, the 3rd Marine Commando, which before then was commanded by the "Black Scorpion" (Benjamin) Adekunle, had almost died. The only force facing the Biafran Army was our division - the first division of the Nigerian Army. Obasanjo was posted around that time to take over command of 3rd Marine Commando. We all thought the command was almost dead - they had troops but the command had not been effective. Our 1st Division had borne the brunt of the war because we fought all the way from the North up to the South of Umuahia in the Igbo territory. It is like World War II. The Russian (Eastern) front was the most deadly front. The Northern front from where the 1st Division came through was the hottest. Shua had been the commander. Just before Obasanjo came to replace Adekunle, Shua also moved out of the 1st Division and was replaced by Bisalla. I will not use rank because they were not Generals at that time. One day, about a week or so to Christmas time (1969), Obasanjo turned up in the headquarters of the 1st Division (Enugu) very early in the morning. I was settled in my office; the GOC (Bisalla) had not come yet. He (Obasanjo) appeared from nowhere very early in the morning and came into my office. He said, well, actually he wanted to talk something with my GOC but that he wanted to talk with me first. He had a map with him. He told me that his troops had been prodding the defences of the Biafran forces; that we were facing them and they had covered two gaps and that he planned to exploit those gaps and link up with us, so that he could divide what was left of the Biafran territory into pieces. He showed me where those gaps were. He said he had come to ask for a coordinated action. He would start and we should make a move also from our front so that we could divide the enemy forces and very quickly finish them. I asked one or two questions. I was very pleased. I told him that this might be first time ever since the Civil War started when the Divisions coordinate their activities and that I was sure it would work. He was very pleased and said, well, he hoped I would help to persuade my GOC. I said I would do my best. Not long after, my GOC, Bisalla, came and Obasanjo moved to his office. I don't know what took lace. But soon after Obasanjo came out. He didn't succeed. Bisalla told him that we had our own plan; we had our date and we would stick to our date. I told him that I was sorry, I wasn't able to persuade my GOC but that the plan was good, that it would work. Obasanjo left and we sat waiting for our D-Day - 15th January 1970 - to move southwards. Christmas period and Obasanjo did what he said - they linked up with our troops. It was when they approached that they told our troops that they were the people. This was at the Umuahia front, and somewhere at Owerri. So, we sat on our backs where Obasanjo walked through the field, and took all the glory, thanks to my GOC who, because of professional rivalry, wouldn't allow us to join in finishing the war. That is how it came about that Obasanjo, who came in at the tail end of the war, took all the glory. You see, in life, you need a lot of luck, and Obasanjo has been a very lucky man - professionally. So, I knew him as a good soldier. WHEN was the second time that Obasanjo drew your attention to himself? The second time that I watched Obasanjo at close quarters was when Gowon was overthrown and the boys who did the coup handed over power to Murtala Mohammed, Obasanjo and I. The boys who handed power to us told us that they wanted power to be exercised jointly. They named Murtala Head of State, Obasanjo as the Chief of Staff (Supreme Headquarters) and me as Chief of Army Staff. At first, Murtala rejected it. He said it was not possible for three people to exercise power jointly and that they did not trust him, otherwise, they would have just named him as Head of State, Obasanjo as Chief of Staff and me as Chief of Army Staff and we would run our various places. They (coup makers) said no, that they didn't want another Gowon, who, towards the end of his rule, wasn't listening to anybody and that they wanted power to be shared by three people. In fact, one of the three boys said, "we don't want an Idi Amin." So, Murtala, at first, said he was not going to accept. Their spokesman said, "if you don't accept, we'll name Obasanjo as Head of State, but in the announcement, we'll say we first offered it to you and you turned it down!" Murtala said, "ah, that is blackmail!" He said, "no, it is no blackmail; it's the truth!" That was when Murtala accepted. In fairness to him, in the six months that he ruled before he was killed by Dimka, Murtala took me on board of almost all the decisions - far-reaching decisions that government was taking, even though I was in faraway Marina. I say faraway because the Ministry of Defence was on Marina and they were in Dodan Barracks. In those days, moving between Marina and Dodan Barracks was one hour's journey. In fact, that is what accounted for Murtala's death - traffic was so bad. In spite of that, Murtala made sure that every single time an important decision was to be taken, he would ask me to stop over in Dodan Barracks, we'd discuss the issue before I'd leave for Marina. In those six months, Obasanjo, as Chief of Staff, was a first class Chief of Staff to the Head of State. As I said, we met very frequently, usually in the evening after close of work, and at every meeting, Obasanjo would have a pad in hand with a pen. As we were talking, he would take down the minutes of the conclusions of the meetings and, unfailingly, the following morning when I got to the Ministry of Defence and sat at my desk, I would find on top of my in-tray the minutes of the previous day's meeting already written out, noting who's to do what on each item. He impressed me a lot as a Chief of Staff. I thought Murtala was very lucky to have a staff officer who was that efficient. That was Obasanjo. Then, Murtala was killed. I think it is public knowledge that Obasanjo fled on the day Murtala Muhammed was killed. He remained in hiding until the coup was aborted and he reached out, first, to M.D Yusuf who then called him and he came out of hiding, and joined us in Dodan Barracks. We discussed the funeral of Muhammed and made arrangement as to who would accompany his remains to Kano, so on and so forth. At the end of the meeting, Obasanjo asked M.D Yusuf and I to stay with him in the chambers (Dodan Barracks). After everybody had left Obasanjo told M.D Yusuf and I that what had happened had destroyed his faith in the loyalty of the Nigerian Army. That he had decided that after the funeral, he would retire, leave the Army and go home. But before that he would name me as the successor to Murtala. I told him that, that amounted to desertion and that he could not run away. He was number 2, number 1 had been killed in battle, he as number 2 would take over. He said no, no, no; that he didn't think he should stay; that he wanted to go. We argued that. In the end, Yusuf said, "look, let's all sleep over this matter; tomorrow we will decide." I said, "look, there's no question of sleeping over it; the point now is we should be looking for who is going to take Obasanjo's seat as number 2 because there is no way we are going to allow him to chicken out and leave at this time; we must all stay and face the future together." So, we left and I went home. By this time, we had called all the members of the Supreme Military Council to Lagos. The following day, he (Obasanjo) started to talk in the same vein and I cut in. I said that Obasanjo could not leave; he had to say and be the Head of State and we should be looking for the number 2 man. I had over night considered the consequences of what had happened and came to the conclusion that if we were not careful; we would end up with a religious conflict on our hands. Already, that evening - the evening that it became public knowledge that Murtala had been killed - Dimka had made a broadcast in which he said, "good tidings" among other things. He had imposed a curfew - from dawn to dusk (laugh) and said all sorts of things using the expression, "good tiding." Abubakar Gumi in the North said that the coup that killed Murtala was a Christian coup because of the utterances of the coup leader, who said, "good tidings" because it is an expression of Christians. Already, there was tension in the North. The governor of Kaduna State, an airforce officer, Usman, had to contain him: that it had nothing to do with Christians, that it was a purely military affair. I knew that if we were not careful, as time went on, we should be consumed by religious strife in the country. I decided that the new Chief of Staff must come from the North preferably, a Hausa/Fulani man. From my knowledge, I had two candidates - (Muhammadu) Buhari, who was really my number one candidate for that post and the late Shehu Yar'Adua. Shehu was not in the country; he was abroad as Minister of Transport. You would remember we had inherited a cement armada in the Lagos and Port Harcourt (ports) and his (Shehu's) first assignment was to decongest the Lagos port and get rid of all the vessels that were clogging Nigerian waters, and attracting huge demurrages from our government. He (Shehu) was abroad attending to that problem when Dimka struck. So, they were the two candidates. Buhari, at that time, and even today, is one of the most upright Army officers that the Nigerian Army has produced - very clean, a very strict officer. Unfortunately for him, he served under me for a short time in Port Harcourt and I observed that he was a very inflexible person. I reasoned that Buhari any day could be a first class Chief of Army Staff. Why waste him in a political post? Why shorten his career because if he became Chief of Staff, he would have to leave at the end of the tenure. Why waste him there? Besides, I observed that he was too rigid, he was too inflexible to hold a political post. If you are in politics, you must be flexible; you must compromise from time to time. In politics, they call it pragmatism. But in the military, if you are pragmatic, it is regarded as a weakness. I said no, not Buhari. Shehu, I didn't know him well except that I knew that, of all the officers of his rank, he was the most politicised. So, sending a politicised Army Officer to a political post, I thought, was a good thing. That was how I named Shehu the next Chief of Staff. When we came to the Supreme Military Council and Obasanjo started singing the same tune that he had sung to me and M.D Yusuf the previous night, I said no, that was not the issue; he was the most senior person and he had to stay there. He had to stay in office. He made some feeble resistance but I think he had slept over our discussion and concluded that if we insisted, he would stay. There were a few voices of dissent. The first came from the Chief of Air Staff, Isa Doko, who said that the problem we were facing was an Army problem and that the Army boys had confidence in me. That we had just crushed an attempted coup, and we should not put somebody there that the Army didn't have confidence in. A few other officers supported him but I overruled them. And so, I imposed Obasanjo on my colleagues in the Supreme Military Council. The Army functions on hierarchy. The moment you start disturbing the hierarchy, you run into all sorts of troubles. 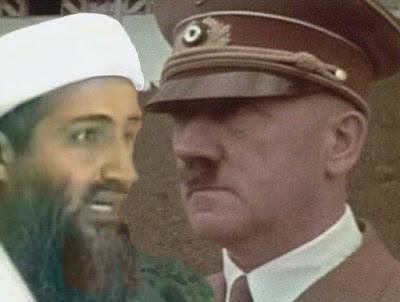 They all knew it. They couldn't fault the basis of my decision. That is Obasanjo. Obasanjo had just defeated (Dr. Alex Ifeanyichukwu) Ekwueme at the Jos convention (of the PDP). He had become the PDP presidential candidate. The two front-runners in the PDP were Obasanjo and Ekwueme. As I told you, I judge people by their antecedents. I had an experience of Ekwueme. After I retired from the Army in 1979, I was named as one of the members of the Governing Board of NIPSS (National Institute for Policy and Strategic Studies) in Kuru. Chief (Simeon) Adebo was our chairman. I was very grateful for the opportunity given me to serve under that old man. I learnt a lot from him. When we went to Kuru, as the governing board, we found that almost all the houses - the round huts that were built to accommodate the participants - leaked like a sieve. The thatched roofs looked nice but leaked badly. As you know, almost every roof in Nigeria leaks because we can't get our roofing right. And so, the students were unhappy. They complained to us. The Director-General was very concerned and he told us that we had to do something about those buildings. We had to decide what to do: whether to repair the roofs or to build new ones. If we were building new ones, should they be round again or square? We debated all that. Eventually, we got a consultant who worked out a plan for us. We did the design, got quantity surveyors to value what we designed and showed the total sum required to reconstruct. We had to look for money. Chief Adebo asked me to accompany him to Dodan Barracks, to see the Vice President. Even today, the Vice President of Nigeria is the officer who supervises the activities of NIPSS. We went, and who was the Vice President, Alex Ekwueme, an architect. So, Chief Adebo and I carried our plans into Ekwueme's office and settled down in his conference room and he came and joined us. Chief Adebo, a meticulous old man, had arranged his argument properly and he made a presentation to the Vice President. He gave reasons we must award the contract now because very soon the rainy season would come and we didn't want the students in the same conditions as in the previous year. Building by building, he explained to the Vice President the cost - what we needed. Ekwueme had a look - the plan and so on - and asked specifically, "what is the cost of each building?" He was told. He said, "we, here, have our own housing scheme and the cost of each unit is X and I will not support any demand from you for funds to build houses that will cost twice of any one of us." Adebo again, very patiently, went through the argument of how this had been done by very professional people and costed professionally and so on and so forth and this was what they said it would cost us. Anyway, we were dismissed - that our estimates were too high. Chief Adebo stood up to pack his papers. I said, "are we leaving?" He said, "yes." "You said our building will cost too much, is it boys quarters we are building? The reason I am asking you is that I have just awarded the contract for the boys quarters for my house in Kaduna and it cost more than the money we are asking you for us to build accommodation for students." Ekwueme had no time and he stood up, meaning we were wasting time. We packed our things and left. Now, what was the result? The buildings that Ekwueme described to us ended up being called Shagari Houses. We in the Army got some of them. If you go into any of those buildings, once you put a bed in any of the rooms, the room (space) is finished (taken up). You can't even go in there and find space to sit. An architect! An architect, Vice President of Nigeria designed those houses; I believe supervised or approved those houses? Of course, those houses throughout Nigeria were un-occupyable. When it turned out that this man (Ekwueme) was a front-runner, and was threatening to be the next Nigerian president, I said no, I would leave Nigeria if Ekwueme became the president. Because, even in his own profession - his own professional knowledge and applying it to his job as Vice President - he didn't do it effectively. How was he going to govern the country? I had that in mind when I made that statement. Thank God it was not Ekwueme. WHAT have you found out now regarding Obasanjo? Looking back now, I underrated the degree of management that we, the military, exercised over Obasanjo to make him a successful Head of State, in the three and half years that he ruled after Murtala. This management and control, which are the responsibility of the National Assembly, were not effected, especially during Obasanjo's second term. It was in the second term that Obasanjo derailed. The irony of it is that this man, Obasanjo - Aremu Obasanjo - has split personalities: there is Olusegun Obasanjo of old and Aremu Obasanjo of Ota. I am talking about Aremu now. Aremu went wild in his second term. The irony of it is that the man introduced EFCC in Nigeria... Corruption had always existed in Nigeria even in the colonial days when I was going to school. In the six years that I spent in the secondary school, every other year when auditors came to audit the account of the Tiv Native Authority - and Tiv NA was one of the largest in the North - unfailingly, those two years, after the audit, they would arrest the treasurer. They would arrest the treasurer because he had been chopping (stealing). In some years, the moment the auditor arrived, the man would flee; he would just run and disappear because of the damage he had done. Also, in the colonial years, if the British (colonial masters) wanted to destroy any traditional ruler, all they needed to do was to send auditors because the traditional rulers were the tax collectors in the North. They just looked at their books. So, we've always had corruption but it was covert. It was opaque until Obasanjo. Obasanjo has introduced transparency; he (also) introduced transparent corruption. You don't have to search to see his corruption. Take the case of his library. A ruling president, while in office, decided that he was going to raise money from the general public including government parastatals to build his personal library. It was by coercion. He coerced all the governors. He told them how much they were going to donate. So, the library was financed straight from the treasuries, the various state governments; from business houses, again, through coercion and threats - they were told how much to bring. Is there any corruption higher than this? This was done when we had a National Assembly with an oversight function on the executive. You said we should probe Obasanjo the same way you said at that time that the Third Term should fail. Who are the 'we'? No, Third Term hasn't failed; we are still in Third Term. Obasanjo is still in charge, sitting in Ota and manipulating a puppet, a spineless puppet in Abuja. The people I pity are the so-called North. Obasanjo served his term for eight years for the Southwest. Obasanjo now is serving Third Term. He is ruling a third term from Ota via Umaru (Yar'Adua in Abuja). And what is the North doing about it? Aremu of Ota is the de-facto ruler of this country, manipulating the government through Umaru. How are you going to deal with him? No, my Yoruba friends told me they knew him; we didn't know him. I thought I knew him. But I ascribe it to the prison. I think he met the devil in prison. Believe me, I think Obasanjo met the devil in prison. He kept saying, "God told him this, He told him that." The problem about the people who claim to be listening to God is that Lucifer, the devil, was very close to God. Most of the time, he (Lucifer) speaks to people and people think that they are listening to God... He said if he wanted Third Term, he would have asked God and God would have given it to him. God, does not belong to anyone of us. And He is tired of us Nigerians that He would allow a... man like Obasanjo to manipulate the country. As I said, Umaru started well by making all the right noises - rule of law, due process, electoral reform, bla, bla, bla and he appears to be on the right track. But if you are on the right track and you are moving but don't move fast, you will be over-run. In his own case - you Lagos people here - I was in a party soon after Obasanjo left office; I started to converse with my driver and he said, "ah, we are happy!" I said, "why are you happy?" He said, "Baba Iyabo don go, but now, we have Baba go-slow." I said, "Baba go-slow?" He said, "yes." I am sure if I found that driver tomorrow and say, "how now?" he would say, "now, we have Baba stand-still." If you stand still in a road, you'll be run over. Right now, we are standing still and the handlers of Yar'Adua tell us that it is because of the court case; that after the court case, he'll start performing. I doubt it. Even if Umaru has no case, for as long as Aremu of Ota is allowed to control the party and to manipulate things, so long will the standstill continue. We need to dis-couple Aremu from Umaru. We have to return PDP to its original constitution where we don't have a gerontocratic and expired former Head of State to sit at the centre of the affairs of the country. And we don't have time. Don't you think that those saying that Yar'Adua is slow because of petitions against him at the tribunal have a point? Illegitimacy is still hanging over him and he cannot afford to antagonise anybody until his mandate is established. I have had two discussions with the president. A very decent man, he listens a lot. He asks questions, he interjects and tells you, "I'll do this." Like me, he doesn't talk much. But Umaru has been president now for eight months and to answer that question, I have to look back and point to things that he has achieved that will give one hope and for that logic to be sustained. I cannot point to anything tangible. There are so many things he could still do. The issue of power supply is very urgent. As days go by, our generating capacity declines tribunal or no tribunal. He should be seen to be addressing that issue urgently. Secondly, nobody knows him; absolutely, nobody knows Umaru in Nigeria. He hasn't shown his face to anybody. He didn't do so during the electioneering campaign. It was Aremu of Ota who was doing all the campaign and doing all the dancing for him. Now, he is very likely to lose his office by the way the tribunals are going and he should be preparing the ground for the next election if he is going to be a candidate, by showing himself vividly. Umaru - nobody knows him, nobody knows what his voice sounds like. Has he made any public statement or broadcast to Nigeria since then? Aremu or no Aremu, Umaru should be doing all that. I don't think that the fear of losing the office is what is keeping him away from the people, who, quote and un-quote, elected him into office. It doesn't give me any confidence that he would do any differently if the tribunal says he actually won the election. I don't think so. And then, the roads! The roads are all broken up and nothing is being done - tribunal or no tribunal. The money is there. There is no use announcing to us that we have $40 billion stashed away in foreign banks as reserve when we have no roads to move around on. Jomo Gbomo writes:February 15, 2008. 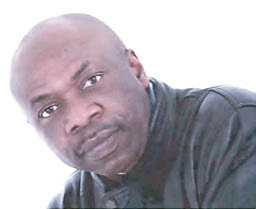 On Thursday, February 14, 2008, the governments of Angola and Nigeria carried out a secret illegal extradition of Mr. Henry Okah back to Nigeria. Henry was beaten, shackled in ankle, cuff chained and blind-folded with a hood before being flown out of Angola under the cover of night to an undisclosed location. But it is believed that he was flown into Nigeria and he is being held somewhere in the northern part of the country. 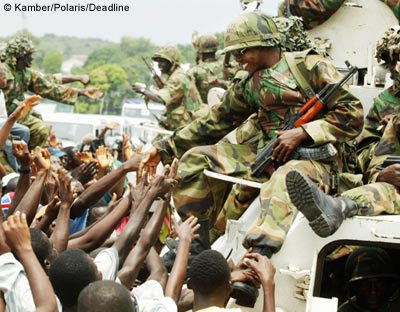 Henry and another innocent individual had spent five gruelling months under the most inhospitable conditions in Angolan jails since September 3, 2007 when he was arrested on trumped up charge of gun running. Later, when the Angolan government at the behest of the Nigerian government could not sustain the charge in Angolan courts, they added a new frame up of sponsoring a failed coup in Equatorial Guinea. All these charges Henry denied because he is innocent. But during the ordeal in that country where there are no laws of civilised conduct (as attested to by the Nigerian government in its only statement so far on Henry’s illegal detention), Henry was tortured and starved to no end in other to extract implicative statements from him. For a long time, he was denied his request of a Bible in the dungeon. Having exhausted their tricks to do the innocent businessman in, the government of President Yar’Adua had gone back to its initial plan of extraditing Henry back from a country it has no treaty with. We do not know what the Nigerian government wants to do to him secretly. Be it known that the Movement for the Emancipation of the Niger Delta (MEND) is following keenly the moves of the government to pin on Henry, bogus and unfounded charges. Such actions are unacceptable to the Supreme Command of MEND. For now, we appeal for calm to the peace loving people of the Niger Delta as we all watch to see the governments’ next line of action. Dokubo Asari, Can he take on the Nigerian State! Hero of the Niger Delta. With these electrifying words, 27-year-old Isaac Adaka Boro, general officer commanding, the Niger Delta Volunteer Service, DVS, declared an independent Niger Delta Peoples Republic, NDPR, February 23, 1966, 40 days after the historic January 15 coup. It was 3 pm and the three divisions of the DVS, made up of 159 troops, were going into action at 5 pm with the objective of dislodging the federal police and taking over Yenagoa at 12 midnight. It was code-named “Operation Zero”. It marked the beginning of the “12-Day Revolution” during which Boro, an ex-police inspector, former president of Students’ Union Government of the University of Nigeria, Nsukka, and a fresh graduate of Chemistry, called “the attention of the world to the fact that the inhabitants of the Niger Delta were feeling very uncomfortable” with their fate in Nigeria.That was an understatement for some of the observers of the time. It was the culmination of the injustice, political frustration and suffocation that the Ijaw and other Niger Delta people suffered in an independent Nigeria. As a bubbling, brilliant young secondary school leaver, Boro, after a three-month stint as a teacher, joined the Nigeria Police as a cadet in 1958 with a lot of fire in him to bring about change. But he received a shock when he found that he was alone in a police force that was already corrupt and was subsequently dismissed due to ill luck, maybe, the call of destiny. Heartbroken, he dusted up his certificate and went to the University of Nigeria, Nsukka, where he suffered various degrees of injustice as a student politician. He came to the realisation that the Ijaw were heading for extinction if the tide of the national politics being controlled by the big three — the Hausa, Yoruba and Igbo — did not change. Boro and other Ijaw students watched with bewilderment as the Ijaw politicians failed to break into the top echelons of Nigerian politics. “We discovered that most of the youths were so frustrated with the general neglect that they were ready for any action led by an outstanding leader to gain liberty,” noted Boro in 1963. “Year after year, we were clenched in tyrannical chains and led through a dark alley of perpetual political and social deprivation. Strangers in our own country! Inevitably, therefore, the day would have to come for us to fight for our long-denied right to self-determination,” he prophesied.Excluded and alienated from power, the Ijaw withered in bitterness and regret. For a then estimated two million people, there were no adequate educational opportunities, no infrastructure, no empowerment, no openings. “Economic development of the area is certainly the most appalling aspect. There is not even a single industry. The only fishery industry which ought to be situated in a properly riverine area is sited about 80 miles inland at Aba. The boatyard at Opobo had its headquarters at Enugu … Personnel in these industries and also in the oil stations are predominantly non-Ijaw,” he lamented.In 1959, Harold Dappa Biriye, after whom the Niger Delta Development Commission, NDDC, headquarters in Port Harcourt, Rivers State, is named, began the journey to give the Niger Delta a voice in national politics by the formation of the Niger Delta Congress, NDC, with fish as its symbol. The hope was that, as the fourth largest ethnic nationality, the party would bring the Ijaw at par with other ethnic nationalities that had their own parties. In the 1959 elections, NDC disappointingly won only one seat in the Federal House through Melford Okilo from Brass Division, Yenagoa Province. NDC leaders had promised during the campaign that a state would be created for the Niger Delta and appointments given to people of the area at the federal level. Understandably, these promises could not be fulfilled. In the 1962 Eastern Region elections and 1964 federal elections, NDC, lost all grounds to the Igbo-dominated National Council of Nigerian Citizens, NCNC, to the frustration of Ijaw nationalists.The political scenario that confronted the Ijaw was very gloomy. The NCNC which ruled the East was not interested in the creation of Niger Delta State for obvious reasons. NDC could not do much as out of the nine representatives of the area, eight were from NCNC. And in the Eastern Region House of Assembly, the Niger Delta had only four against 110 other representatives. In the Midwestern House of Assembly, Niger Delta had two representatives against 58 others.“Given these prevailing circumstances,” lamented Boro, “an Ijaw nationalist finds that a state for his people is more of a necessity than a mere desire… Such a demand becomes all the more compelling when the area is so viable yet people are blatantly denied development and the common necessities of life.” But to have a state, an agitating area had to get the approval of the regional government or governments within which it falls, one other regional government and also the federal government. That meant that the East and Midwest regions must accede and they were not willing. The North and the federal government could not override them because the North was afraid of NCNC, which controlled the East, and Midwest retaliating by supporting the creation of Middle Belt State. What irked the Ijaw more was that during the plebiscite campaign for the creation of the Midwest Region, they were promised that in the event of the creation of a state in the Niger Delta, the Ijaw in Midwest would be allowed to join their kith and kin in the East. So, the Ijaw found themselves hedged in, like the Shakespearean stag tied at the stakes and bayed about by many enemies. It confirmed the worries of the pre-independence fears which made Biriye lead a delegation to London to make a case for the minorities. The fruit of their effort was the Willinks Commission set up in 1958 to investigate the fears of minorities. The commission confirmed that the fears were real and recommended a Niger Delta Special Area status for the Niger Delta. Consequently, the Tafawa Balewa-led federal government set up the Niger Delta Development Board, NDDB, to cater for the special needs of the Niger Delta. This did not achieve the desired development. Furthermore, the Eastern Region government refused to make any contribution to the board.It dawned on the youths that Ijaw politicians would never achieve results for the area. In October 1962, Boro, then an undergraduate of UNN, began the movement that would, in 1966, start the violent campaign to end the marginalisation of the Niger Delta “to discuss the political future of our people”. They became known as the Internal Caucus. Boro was elected the secretary-general. “Our primary objective was to organise ourselves into a strong political force to struggle for our self-determination as soon as we graduated,” Boro explained.In 1963, Boro and his Internal Caucus took their campaign to the embassies of some countries whom they considered advocates of freedom. They did not get the desired support. In 1964, Boro and Samuel Owonaru, later to be his second in command in DVS, toured West African countries to conscientise Ijaws living in the West Coast about the plight of the their people in independent Nigeria. They visited Dahomey (Benin Republic), Togo and Ghana. In Ghana, they visited the Cuban Embassy where they hoped that Fidel Castro’s country would be keen to support the freedom of Ijaws. The ambassador gave them 60 minutes to vacate the embassy. After graduation, Boro was employed as a technical officer in the Faculty of Science, University of Lagos. Again he, Owonaru and other youths formed Integral WXYZ “to prepare the minds of the Ijaw youths for the ripe moment”.That ripe moment was the killing of Balewa on January 15,1966. He resigned his job, cashed his emoluments, sold his property and with £150, returned to Kaiama, his hometown, set up camp at the Taylor Creek and began recruitment. After six weeks’ training, they struck. And 12 days later, the revolution was foiled and Boro and his lieutenants were arrested. Boro and all his commanders were condemned to death. But fate favoured them and General Yakubu Gowon’s government freed them and created Rivers State and Lieutenant Commander Diete Spiff, an Ijaw, was made governor. It was a dream come true. The revolution had failed and yet succeeded. “My men and I, with the creation of our state, are now free to help not only our people, but also Nigeria, to peace, unity, stability and progress,” Boro enthused in 1967.But this was not to be. The civil war started and Boro gladly became a major in the Nigerian Army. He was killed on April 20, 1968, near Port Harcourt and that muted the radical voice of the Ijaw against the disappointments in their expectations for the next 30 years. Nigeria deteriorated under the unitary military regimes and worsened the plight of the Niger Delta. Then Ken Saro-Wiwa, poet and novelist, who had worked with and seen the inside machinery of governance, concluded that Nigeria had not delivered on the expectation of the Ogoni, who, too, like the Ijaw, were very protective of their identity.The British administration had forced the Ogoni into the administrative division of Opobo in 1908, which they protested. In 1947, they were placed under the Rivers Province and, in 1951, they were included in the Eastern Region, where, they say, “we suffered utter neglect”. They protested this by voting against NCNC in 1957 and underscored it in their testimony before the Willinks Commission of Inquiry into Minority Fears in 1958. In 1967, they were included in Rivers State.The Ijaw and Ogoni have one more thing in common — oil. While oil was struck first in the Ijaw territory of Oloibiri in 1956, it was also found in commercial quantity in the Ogoni territory of K. Dere, known as Bomu Oil Field, in 1958. In all, the Ogoni have seven rich oil fields, which have contributed an estimated, unofficial, $40 billion to the national revenue. Despite this contribution, Ogoni nationalists regret that they had no representation at the national level, no pipe-borne water, no electricity, no job opportunities in the federal, state, public and private institutions, and no social or economic project of the federal government, even as crude oil flowed from their land into waiting oil tankers for export.Against this background, in 1990, the Ogoni made of Babbe, Gokana, Ken Khana, Nyo Khana, Ueme and Tai, with a population of about half a million, formed the Movement for the Survival of Ogoni People, MOSOP, under the leadership of an eloquent Saro-Wiwa. The motto of the organisation is “Freedom, Peace and Justice”. It was founded on the principles of non-violence and equality. Among its aims and objectives are three definitive ones: to promote and sustain the struggle against all forms of injustice, to create and sustain the identity of the Ogoni people as a separate and distinct nation (within Nigeria) with a right to self-determination and to the control of their resources and their environment, and to ensure that the Ogoni people obtain their rights within the Nigerian state.Thereafter, they proclaimed the Ogoni Bill of Rights. While reaffirming their wish to remain a part of the Nigerian polity, the Ogoni demanded seven basic guarantees from Nigeria predicated on “political autonomy to participate in the affairs of the republic as a distinct and separate unit by whatever name called”. Of course, Nigeria did not deliver. The relationship between the Ogoni and Shell, which was exploiting the oilfields in their land, worsened and the federal government arrested Saro-Wiwa and seven other Ogoni activists. They were hurriedly tried, condemned to death and hanged on November 10, 1995, an act which has been widely described as judicial murder. Consequently, the Ogoni sacked Shell from their land for about 12 years. Ogoni oil has been under lock and key as all reconciliation efforts failed. Ledum Mitee, president of MOSOP, who survived being hanged along with Saro-Wiwa, said the Ogoni would rather prefer another oil company to Shell. In 1998, Ijaw nationalism welled up again as successive governments failed to meet the basic expectations of the Ijaw. An all-Ijaw youths conference was held at Kaiama, Boro’s hometown, on December 11. The youths made 10 resolutions known as the Kaiama Declaration. They reaffirmed that “all land and natural resources within the Ijaw territory belong to Ijaw communities and are the basis of our survival.” Consequently, they “advised all oil companies’ staff and contractors to withdraw from Ijaw territories by December 30, 1998, pending the resolution of the issue of resource ownership and control in the Ijaw area of the Niger Delta”. They asked for a sovereign national conference to restructure the Nigerian federation. Finally, the youths resolved to set up the Ijaw Youth Council, IYC, “to coordinate the struggle of Ijaw people for self-determination and justice”.Asari Dokubo became the second president of IYC. From his student days, he had, like Boro, been preparing himself for the liberation of the Ijaw. What started as political disagreement because of his protest against the rigging of the 2003 election snowballed into guerilla warfare for resource control. To protect himself, Dokubo, who sees himself as the spiritual successor to Boro, dusted up the DVS which had survived as Niger Delta Peoples Volunteer Force, NDPVF, and engaged the federal troops. His arrest in August 2005, in violation of a ceasefire agreement, led to the rise of the Movement for the Emancipation of the Niger Delta, MEND, and other militant groups. Hostage-taking entered the arsenal of the militants as a bargain chip and later as a source of revenue. Today, the Niger Delta is still on the boil. The Ijaw National Congress, INC, says no palliative shall work until the Nigerian federation is restructured to be a true federation where the components control their resources and pay taxes to the centre. This was the basis of the federation under the regional governments. In 1953, the derivation principle in revenue allocation was 100 per cent. By 1960, it went down to 50 per cent. During the Nigerian civil war, it was blanked out to zero to, perhaps, fund the war. By 1982, it was only a whisper at two per cent. It was further reduced to 1.5 per cent in 1984, and in 1992, it was doubled to three per cent. Currently, it is 13 per cent and the campaign is on for either total resource control or a minimum of 50 per cent derivation.Kimse Okoko, a professor and president of INC, says that the resolution of the Niger Delta impasse should begin with the repealing of some laws which support the marginalisation and impoverishment of the region. These are: The Land Use Decree of 1978 which vested ownership of all land in the government; the Petroleum Decree of 1969, amended in 1991: Decree No. 52 of 1993, known as Osborne Land Decree; and the National Inland Waterways Authority Decree No. 13 of 1997. There is also the controversial issue of maritime boundary of coastal states solely for the purpose of derivation which the federal government puts at 200 nautical miles from the low water mark. The target is to deprive the states of their offshore oil wells. Victor Attah, former governor of Akwa Ibom State, who led the resource control fight, argues that Nigeria can lay claim to these wells because they belong to the states which are part of Nigeria. Therefore, Abuja can only lay claim on the basis of the natural owners of the continental shelf. The Niger Delta has also been excluded from active participation in the oil industry. Oil wells in their backyard are awarded to people who are predominantly from non-oil-producing states, who exploit the land without regard for its owners. This is perpetuated by what they believe is their near exclusion from power. The Presidency, like a Father Christmas, doles out oil licences as it pleases. For instance, President Umaru Yar’Adua doubles as the minister of petroleum. He borrowed a leaf from former President Olusegun Obasanjo who handled the oil ministry for the eight years he was in office. 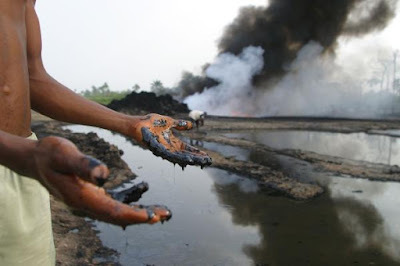 Meanwhile, the owners of the oil wallow in neglect in an abused environment and the youths are driven to crime as a ventilation.As it is, the future, says Okoko, is not bright for the Niger Delta as the majority groups may not support restructuring or increase of derivation to 50 per cent as demanded. But if Nigeria wants peace, it is a challenge it must confront. If not, the agitation will continue and, who knows, one day, the God of justice, as Boro predicted, might hearken to the voice of the Niger Delta and intervene. © 2007 Tell Communications Ltd. All rights reserved. n recent months I have stumbled into the middle some rigorous and thought provoking conversations, many of which have taken place on the internet in Nigerian Yahoo groups. Several have centred on what they would describe as 'Christianity' and whether it remains one of the last vestiges and forms of oppression from the Western world. Some of the conversations have thrown down a number of challenges to my own Christian faith. Some of the protagonists have queried the existence of Jesus Christ beyond the pages of the Holy Bible and the 'White' images of angels that are abound in many publications and query why His virtues are not matched by the integrity from its many adherents. With every statement of justification I advance in support of the Christian message they attempt to match it with a response, attaching evidence of some alleged atrocities committed by a 'born again' Christian. With every rebuttal I deploy against such stereotypes and generalisations I am presented with more evidence of a perceived lack of grace and truth on the part of the 'born again Christians'. Recently my 'protagonists' directed me to a breaking story of a Pentecostal pastor who was charged to court in Lagos for embezzlement. They pointed this as evidence of the shallowness and futility of the Christian faith. A few others have ventured the mention of the vast amounts of wealth which seem to be concentrated with the Church. Whilst some have queried the need for prayers in the midst of the abject poverty the Church faces in around it. This theme I hope to return to in the course of this article. In continuing this article, I must pause and draw from the example of my respected learned friend, Sean Akinrele, the author of 'Foxes in the Vineyard', by stating absolutely clearly, that my desire to write this article is not predicated on any basis that I am a solution but more relevantly because I have not always stood for or spoken the truth, seen my own wilful backslidings and because I am an answerable member of the body of Christ. I recall with nostalgia, a time in Nigeria when references to the word 'born-again Christian' imputed integrity, purity and certainty even when various observers wondered whether these were downright fanatics or members of the deranged class. I became 'born again' against this background in the very late 70s. On personal reflection I remember that one of my very first acts of repentance was to make restitution to a number of mates I had swindled in my local area. In my memory is etched, the change of my attitude to chores at home to the extent of transformation and how my Mother noticed a difference in me. I recall how my use of language became more refined and abuses and curses fled from my vocabulary. I remember very vividly the humility of the men of our great God that surrounded and influenced me at the time. However, the word 'born again' appears to now be equated with activities of the 419 varieties, given rise to a coverage and a cloak for all sort of questionable activities that ought not be associated with Christians. And some argue that 'Christians' attempt to dignify their misdemeanours by creating a Sunday space of praise, thanksgiving, blessing, repentance and forgiveness to atone for the misdeeds of the previous six days only to resume their activities after that space has expired. If stories that constantly circulate in the Nigerian press are to be believed then it appears that the hallmark of many 'Christians' today does not in fact manifest and consist in being salt and light in/of their respective communities. Yet the same scripture they hold with reverence and believe to be inerrant states: "If any man be in Christ he is a new creature". It is also sad that some of the traits described above are not limited to Nigeria but have assumed a global dimension. The other day I was in conversation with a man of God in the United Kingdom, who shocked me, by revealing that insurance scams and other fraud of similar varieties where alive, thriving and present in the Church. But it will be a wrong and a gross misrepresentation of the many Christians who manifest the grace and love of Christ to take the above as the common narrative that dominates the landscape. For every 'born again' that betrays that profession, there are many who by the power of God live exemplary and sacrificial lives attempting to bring, truth and grace into many situations they face and encounter. There are many acting as the salt and light of their communities and therefore any brush that sweeps away born agains or characterises them together as charlatans would be misleading and unfortunate. The question I venture to ask is when Jesus voluntarily engaged a social outcast like the Samaritan woman in face to face conversation, was he performing a 'political action' in challenging the political taboos of his society? It has been advanced that Jesus responded not as simply the evangelist, nor the social reformer, but as Jesus the Christ, or Integral Mission. We see in that text, the whole of Jesus responding in love to the whole of this woman's needs, and we see him doing it in word and in deed. This woman clearly had social, emotional and psychological needs, but Jesus met them by openly talking with her. She also had spiritual needs, to know him as a saviour, and Jesus clearly communicates both her need and his ability to meet it. He neither neglects any aspect of who she is, nor any aspect of his responsibility towards her. By his words and his actions he communicates God's love into the whole of her life and both evangelism and social reform are communicated together. "Integral mission flows out of an integral gospel and integrated people. There is a great danger that we transform the mission of the church into a set of special 'project' and 'program', whether we call them 'evangelism' or 'socio-political action', and then look for ways to integrate these methodologically. Rather, the mission of the church is located in the adequacy of faithfulness of its witness to Christ. Our core-business is neither the take-over of the world's systems nor the maximising of church membership. Moreover, we need to remember that the primary way the church acts upon the world is through the actions of its members in their daily work and their daily relationship with people of other faiths. A congregation with huge social welfare projects or many 'church planting' teams may be far less effective in secular society than congregations which have none of these things but train their members to obey Christ in the different areas of civic life which they are called." May I draw some conclusion by suggesting that the Nigerian Churches, in their magnificence, beauty and size cannot truly exist to His glory except the people that inhabit them by their action speak to the wholeness of men and women they come into contact on an everyday basis. Let our boasts and our responses to the cynics be, not in the number and size of our congregants but in the evidence of the transformation of Society. For within the Church lays the potential to reclaim the counter cultural force it once was in years past rather than in the realm of the norm that it exists today. When will all the atacks and killing of innocent people stop. The Nigerian Goverment and the oil companies must listen to the voice of reason and give the people of the oil producing the right to recource control and seld - determination. Bloggers view. Gunmen attacked a gas export plant in southern Nigeria on Monday, killing a naval officer and forcing several others to dive for their lives into the water, the navy said. The unknown attackers stormed the multi-billion-dollar liquefied natural gas plant at Bonny Island in Rivers State and shot at navy personnel before fleeing, a naval spokesman told AFP. An industry source said there had been a second attack in the area on a security boat operated by Texaco, a unit of Chevron Corp. (CVX) but neither the navy nor the police could confirm it. No group has claimed responsibility for the incident at Bonny Island, the latest in a series of attacks to have afflicted the restive Niger Delta region in recent months. Instability and violence in the region slashed by a quarter oil output in Nigeria, the world's eighth-largest crude exporter, in 2006 and 2007 to 2.1 million barrels a day. ISLAMIC NIGERIA ~MUCH MORE BLOODY CONFLICT RIDDEN THAN KENYA. 1. Nigeria, later becoming Islamic Nigeria, and Kenya were created by the colonial system in exactly the same way. In each of them, like the other colonies, disparate tribes were forcibly merged together, and given their respective names. This happened towards the end of the nineteenth century. Discussing the creation of colonies in Africa Margery Perham, a former Oxford don wrote that in colonising Africa, Great Britain had to take account of the structure of the communities or tribes. “ The tribal divisions, ( there in Africa ) are so great “ she wrote , “ That they cannot be overlooked. The new unity ( of tribes ) is something built above them ( that is the tribes ) from outside by foreigners. These drew lines on a map and called the area with a great collection of independent tribes which happened to be inside those lines , by a convenient name like Nigeria or Kenya. They ( the foreigners ) then set up a single twentieth century foreign government over all these tribes.” Br. Rule In Africa. ~ Oxford U. P. 1941. At Independence, we Africans lazily continue in this form. 2. The two countries and others like them were ruled for the average period of fifty five years only. In the name of all the tribes, Kenya fought for independence, and got it. But they suffered great loss of lives. Nigeria got independence “On a platter of gold ” and without a scratch on any one. Many in Nigeria think that, the different tribes in Nigeria are the most cowardly of Africans. More than 300 disparate tribes, each in its own separate location, plus fundamental warring religions; they could not have fought together, for independence. However in both Nigeria and Kenya all the obnoxious cultures of the different tribes, remained dormant all through the colonial system. They all spring up after independence. And in Nigeria, the worst cultures and religious practices sprang up as with vengeance. These include Sharia, and fatwa. 3.While Nigeria suffers from never ending bloody conflicts which have gulped the blood of more than two million people , particularly in the wholly Christian Niger Delta , Kenya , since independence, has lived a rather false life of inaction on the part of the disparate tribes. Their inaction, was wishfully interpreted by Europeans to mean peaceful existence among the disparate tribes forcibly merged together and given the name Kenya. And they tried to build Kenya up like a model for the rest of Africa. But the rot in Kenya continued to grow larger and larger until the election in January 2008. Now the never ending bloody conflicts which characterise monster Nigeria, Sudan and others have caught up on poor Kenya. It is fortunate for Kenya that, unlike monster Nigeria and Sudan, it has no Islamic fundamental warriors. Its problems must be quite easily solved. Probably not by the secret method being brokered by some of its own politicians. Mr Kofi Annan, the former United Nations Secretary General, may be trying to help the fighting tribes, but his ever sad looking face on the T.V. inspires very little confidence. He can’t broker a permanent peace.. The conflict is not a sudden reaction to an election. It is rooted in the origin of the country. Unless it is considered as such, a solution will not succeed. In other words, the problems must be attacked from the source if it must be settled once and for all. This means consideration must be given to the manner in which the tribes were forcibly merged together for colonial purposes. .
4. In a highly developed European nation like Czechoslovakia separation was found to be the only permanent solution. Even here, there were only two disparate communities . Kenya has more than eleven. It sounds nonsensical to suggest that every tribe should become a nation. But groups of agreeable tribes could become one nation; provided only, that each of them actually agrees on the terms on which they would become one nation as the Americans did in forming the United States of America. The leaders of Yugoslavia refused to follow that method. One can see how they fooled about with their lives as they ended with millions of deaths. Yet some of the tribes in Yugoslavia still remain unsettled. In solving the problems of Kenya comprising several disparate tribes each located in its own separate geographical position, the leaders must not import DEMOCRACY . In Africa democracy is anathema. It also has a deceitful appearance. It enables large tribes to justify their rule, control, and exploitation of the smaller tribes as in Nigeria. The Greeks who introduced democracy were the same people in every way. So too are Europeans . Every country in Europe, the Middle East and Asia, comprises peoples of the same way of life or like -minded peoples. They also enjoy one basic religion that influences their culture and their politics . So democracy works for them. In 1947, in India, Mohammed Jinah saw the problem quite easily. He initiated the carving out of Pakistan from ancient India which was not even created by the colonial system. 5. In Nigeria since independence in 1960, only the Hausas and their Islamic related tribes have ruled the country on their own authority, except for a brief period of six months from January 18th to July 27th of the same year 1966. It is they the Islamic Northerners alone, who reshaped the country arbitrarily up to this day. They and they alone arbitrarily changed the country from what was three federal regions to thirty six states, step by step, and one ruler after the other. They changed it from its federal character , but they cleverly retain the term federal. The corrupt and cowardly intellectuals of the South see it so, but they have no ability to resist it. The Northerners rake all the money around these Southern intellectuals , but they laugh like okobo, the Yoruba term for ineffectual entity. There is nothing like federation in the arrangement in Nigeria. The central authority and ruler controls all the revenue which is shared to each of the states created by the Islamic North. All these were done arbitrarily by the Islamic North. They are omnipotent. 6. Fortunately for them, it was to them that the colonial power transferred power.. This power was interrupted by the South from the 15th of January 1966 to the 27th of July the same year 1966. In 1967, one group in the South, the Ibos staged an attempted secession which failed. Since then the country has continued under the ascendancy of the powerful Islamic North. During this period they recreated the country arbitrarily from three states to twelve states and then to eighteen states, to twenty four states and finally to thirty six states. They also created local governments throughout the country. And they created more in their areas . Both the states and the local government share the revenue from oil according to population organised exclusively and arbitrarily by the Islamic North. Then again they manipulated census and population to favour them. There were unorganised protests by Southerners. But these did not succeed. Southerners were slaughtered to silence, as their big men hunt corrupt deals. 7. Then in 1995, the Islamic Leader Sani Abacha, to help Shell in its exploitation of the Niger Delta, killed the whole leadership of Ogoni led by Ken Saro Wiwa. For this the Commonwealth suspended Nigeria. Later Abacha died. The Islamic North felt that they had secured themselves with the arrangement for finances to them, they set to introduce what they call Democracy. They plucked out an old penny, a Southerner whom they had earlier used. He was Mullah O. Obasanjo. He came to power on the understanding with them that he would do nothing against their interest. He was sworn in as a civilian President in May 1999. By October, one by one the whole of the fourteen large Islamic states declared Sharia with the fanfare of killing Southerners and driving them away from their area of the country. Mullah Obasanjo did nothing at all. Instead in December as the world was preparing for the New Millennium, he sent his bombers and troops, and they killed thousands of people in Odi in the Niger Delta. 8. All the killings were carried out because of the Oil they must exploit. By the time Obasanjo finished with his governing of Nigeria in 2007, the Niger Delta had been thoroughly beaten to complete submission. Ironically, Bayelsa, the part of the Niger Delta which Obasanjo’s military killed more people, was the part to which the Judas, Jonathan Goodluck hailed from. But he dragged several otherwise good patriots of the Niger Delta to his blind alley. Albeit, they slow down the struggle of the people for separation which is the one and only solution to the never ending bloody conflicts in Africa. Jonathan Goodluck is worse than Judas, because Judas returned the evil money he earned by betraying Our Lord Jesus Christ. The Badluck Jonathan is enjoying jungle Abuja, which Abacha and others like him, use own blood money to build. But like Lucifer, the Badluckman, cannot be happy, having betrayed his own people so deadly. So let him enjoy jungle Abuja like Lucifer is enjoying Hell. These Satans cannot see the glorious sandy beeches, fresh water as well as salt water lakes, the boating facilities and other beauties of our Niger Delta that shames bush Abuja, the leprosy infested jungles that tries to become Beverly Hills with Southern finances. 10. It is likely that Kenya will be settled much sooner than any of the regions of Islamic Nigeria. The power of corruption and the dream for easy money are not as strong in Kenya as in Nigeria. The Islamic North has nothing whatsoever to give to us in the South. We have every thing they need. Yet they lord it over us. And so my late friend Ogunde, sang the inspiring melody “ Yoruba Ronu.” In 1995 when the Ogoni patriots were killed by General Sani Abacha in order to give free hand to Shell, to exploit the resources of the Niger Delta, the London popular Daily Newspaper INDEPENDENCE, wrote in sympathy with the people of the Niger Delta, the following “ In the 19th century explorers and colonisers won over the natives of the Niger Delta with gifts of colourful beads and fine clothes. Today (December 1995 ), the goodwill of the indigenous communities of the Niger Delta, comes a little more expensive ~ but not much more , when you consider that Shell is earning more than half a million dollars a day from the region “ Today 2008, Shell is earning more than a billion dollars per week in the region. Very often, some of us meet nice people who express sympathy to us , as they say ~ “ It’s a pity your people are so foolish “ Yes. Our people are wretched and poverty stricken, and their wonderful cultures disappearing under their extreme misery , while political fools and traitors, like Jonathan Goodluck, serve the interest of the Islamic Northern Nigeria ; all because he is very foolish. $400 Billion dollers stolen and we are still counting! Nigerian Tribune, February 11, 2008. Nigerian leaders have embezzled about $400 billion between 1960 and now and most of them are still not being challenged. This was disclosed by the acting chairman of the Economic and Financial Crimes Commission (EFCC), Mr. Ibrahim Lamorde, at the capacity development training on investigative reporting organised by the Wole Soyinka Award for Investigative Reporting (WSAIR), in collaboration with the British High Commission and the Canadian International Development Agency (CIDA. Lamorde, represented by his Chief of Staff, Mr. Dapo Olorunyomi, said most of the leaders could be easily exposed by the media if given free hands to operate. According to the EFCC chairman, the commission was able to achieve all the successes credited to it with the supportof the media through since inception. Lamorde said the EFCC was appreciative that the people commended the it for doing so much, but to a large extent, it was because the media had been supportive in projecting its work. He said there was the need for a better media understanding on corruption, “because for a very long time, people saw corruption mostly as something social, but it is very technical in nature,. “This is why the commission, in partnership with the Wole Soyinka Investigative Centre, is proposing to hold a two-week certificate course for journalists with investigative background who want to do corruption studies. When Officers and Men of the Nigerian Armed Forces Openly write the President and Commander in Chief,, It can not be a funny story, The President must re collect the 2nd Republic, a minor rumble in the army on the docility of the then President Shagari gave the army the courage to stage a palace coup. Yaradua must look into the problem in the Army. Nigeria does not deserve another Millitary Coup! A word is enough for the wise. We, the above named patriotic officers of the Nigerian Army are very sad that you have chosen to celebrate the Armed Forces Remembrance Day with corrupt and thieving Generals despite the tension in the Army over the stealing of our salaries and allowances. Your security chiefs, excluding those of the Armed Forces can confirmed to you that all ranks in the army are aggrieved and are openly protesting to whoever cares to listen. Because of the development, the Patriotic Majors rose from a meeting in the ancient city of Ilorin on 11 January 2008 and decided to inform you that:a. The thieving Generals of the Nigerian Army have misappropriated funds allocated for recent salary increase.b. Unlike other institutions like the Navy, Air Force, Police and other para military outfits, allowances to the Army are being paid piecemeal. This is to say our thieving Generals are now sourcing for funds from where they hid the money.c. While other institutions have paid 11 months arrears as directed by the Federal Government, the thieving Generals have paid only 3 months arrears.d. The 3-month arrears paid by the Nigerian Army is 75 per cent less than what the Navy and Airforce paid their personnel for the same period.e. The Navy and Air Force have so far paid 5 months arrears, while our thieving Generals insist the Army is only entitled to 3 months arrears.f. Our thieving Generals claimed that furniture and transport allowances paid to officers and soldiers in 2007 were deducted from the paid arrears. However the Navy and Air Force personnel who enjoyed similar payments did not suffer any deduction.g. It is unthinkable that a Police Inspector could collect more money than a Major in the Nigerian Army because our thieving Generals are insensitive. The CDS and COAS are neck deep in this scandal.h. We are aware that you did not authorise the promotion of your brother who was not due for promotion in 2007. It was a ploy by our thieving Generals to impress you and enhance their stealing efforts. A copy of the letter signed by our Military Secretary which made your brother ineligible for promotion is enclosed for your attention. The majority of the qualified officers who were not promoted because of Major Yar’ Adua are still very bitter.i. During the last Nigerian Army Games, junior officers and soldiers were conveyed to the games venue from across the country in open trucks without tarpaulin or any cover from rain and the sun. Our thieving Generals did not consider hiring buses despite the millions of Naira voted for the games and other monies donated by state governments/corporate bodies. This is because the thieving Generals have since lost touch with reality and do not consider the welfare of subordinates as important. 2. Your Excellency, over two years after your predecessor approved a car loan scheme for officers, half the Nigerian Army officers are yet to benefit from the scheme. Some of us can hardly explain to our wives and children why our colleagues in the same offices and barracks are driving new cars. Most Majors are yet to get the 307 car because our thieving Generals opted to collect 307 for their wives and concubines instead of the 405 allocated to them. It is only in Nigerian Army that Generals could opt to eat first not minding if the food will get to their subordinates. We are tired of their stealing which they have now dubbed change management.3. We cannot continue like this, and the Patriotic Majors will act if the Federal Government fails to take necessary action between today and 15 February 2008. We ask for the immediate removal and subsequent trial of the CDS, COAS, Director of Finance, Principal Staff Officers at the AHQ and the GOCs. They all benefitted from the loot when it was shared. They equally have lost all moral justification to lead the Army. We remain loyal to you and committed to democracy. Cant wait to see the Day Bin Laden will Face Justice and the Day the United States of America will stop dropping bombs on the weak! From Rule of Force to Rule of Law. During the Obasonjo Years, the Presidency would have overulled the judgement of the Nigerian Court, It is commendable that President Yaradus seem to be obeying the law of the land. its a depature from the rule of force under the Obasonjo years, to the Rule of Law. However when will the common man on the street start benefiting from the "rule of law" ? Over to you Mr President. President Umaru Yar'adua has asked the Kogi state governor, to vacate office immediately and handover to the speaker of the state assembly.A statement issued today by Olusegun Adeniyi, the president's special adviser on communications, said the president acted in accordance with Section 191 of the 1999 Constitution of the Federal Republic of Nigeria.The statement said the president has directed all relevant authorities to facilitate the immediate swearing-in of the Speaker of the Kogi State House of Assembly as acting Governor of the State. ''As indicated by Section 191, Subsection 2, the Speaker will hold office until a Governor is properly elected within 90 days as ordered by the Court of Appeal. ''President Yar’Adua has also directed the Police and other law enforcement agencies to ensure that law and order are maintained in Kogi State in the aftermath of today’s ruling by the Court of Appeal. ''He advises all those adversely affected by the judgment to accept it in good faith as a necessary aspect of the evolution of true democracy in our country,'' the statement added. Yoruba National Flag ! Odua Kingdom In Nigeria! OKIN. Behold Yoruba National Flag. You Wonder why South Western Nigerian Goverment fail to fly the flag side by side that of the Nigerian Green White Green Flag. The first obvious answer to this question is the Yoruba are a nationality, numbering about 40 million, the majority of whom live in the South Western part of the state of Nigeria in West Africa. Obvious as this answer is, it is not wholly explanatory, and certainly, it is not without its own controversy. First, regarding its explanatory status. One has to add, that the Yoruba are people, that speak a common language, Yoruba, which belongs to the Kwa group of the Niger-Congo linguistic family, and it has about 12 dialects; that they are a well urbanized group with genius in arts as symbolized in the famous "Ife Bronzes"; that Yoruba people are also found in Togo, Benin Republic and in other parts of the world, including Brazil, Cuba, Trinidad, and the United States. Second, regarding its controversial status, one has to confront the question what makes the Yoruba a nationality, or a nation, not a tribe or clan, and how does one then mark a distinction between Yorubaland and Nigeria. To this last question, there is no better answer than the one provided by Obafemi Awolowo in 1947, to which a later section of this presentation will return. For now, it is necessary to answer the question: "Who are the Yoruba?" by focusing on some critical moments in Yoruba history and thought. Address these and other issues by focusing on some critical moments in YorubaHistory. 1. The Oduduwa Dynasty and the Founding of the Nation.Oduduwa is the legendary progenitor of the Yoruba. There are two variants of the story of how he achieved this feat. The first is cosmogonic, the second, political. The cosmogonic version also has two variants. According to the first variant of the cosmogonic myth, Orisanla (Obatala) was the arch-divinity who was chosen by Olodumare, the supreme deity to create a solid land out of the primordial water that constituted the earth and of populating the land with human beings. He descended from heaven on a chain, carrying a small snail shell full of earth, palm kernels and a five-toed chicken. He was to empty the content of the snail shell on the water after placing some pieces of iron on it, and then to place the chicken on the earth to spread it over the primordial water. According to the first version of the story, Obatala completed this task to the satisfaction of Olodumare. He was then given the task of making the physical body of human beings after which Olodumare would give them the breath of life. He also completed this task and this is why he has the title of "obarisa" the king of orisas. The other variant of the cosmogonic myth does not credit Obatala with the completion of the task. While it concedes that Obatala was given the task, it avers that Obatala got drunk even before he got to the earth and he was unable to do the job. Olodumare got worried when he did not return on time, and he had to send Oduduwa to find out what was going on. When Oduduwa found Obatala drunk, he simply took over the task and completed it. He created land. The spot on which he landed from heaven and which he redeemed from water to become land is called Ile-Ife and is now considered the sacred and spiritual home of the Yoruba. Obatala was embarrassed when he woke up and, due to this experience, he made it a taboo for any of his devotees to drink palm wine. Olodumare forgave him and gave him the responsibility of molding the physical bodies of human beings. The making of land is a symbolic reference to the founding of the Yoruba kingdoms, and this is why Oduduwa is credited with that achievement (Idowu, 1962). According to the second version of the myth, there was a pre-existing civilization at Ile-Ife prior to its invasion by a group led by Oduduwa. This group came from the east, where Oduduwa and his group had been persecuted on the basis of religious differences. They came to Ile-Ife and fought and conquered the pre-existing Igbo (unrelated to the present Igbo) inhabitants led by Oreluere (Obatala). Obviously, there is a connection between the two versions of the story. The political one may be the authentic story of the founding of Ife kingdom through conquest. However, the myth of creation lends it a legitimacy that is denied by the conquest story; just as it appears that it is lent some credence by the fact that, as a result of the embarrassment it caused their deity, the followers of Obatala are forbidden from taking palm wine. Indeed the second version of the cosmogonic myth also appears to foreshadow the political variant. The claim that Obatala got drunk and the task of creation had to be performed by Oduduwa already has some political coloration which is now explicit in the political version of the tradition. What is crucial in both variants of the story is the role of Oduduwa as the founder of the Yoruba nation which is why the name cannot be forgotten. Oduduwa is the symbol of the nation, the rallying point for al those who subscribe to the Yoruba identity. The name Yoruba itself, according to historians Smith, Atanda and others, was fixed on us by our northern neighbors and later popularized by colonial publications. Before then, the "Anago" to which some Yoruba in the present Benin Republic and others in the new world still use to refer to themselves, was used to refer to most of the people called Yoruba today. A common origin and language, as well as common political and religious cultures made the Yoruba a nation long before any contact with Europeans and the advent of colonialism. 2. Moremi 's Patriotism and the Survival of the Nation Upon the death of Oduduwa, there was a dispersal of his children from Ife to found other kingdoms. These original founders of the Yoruba nation included Olowu of Owu (son of Oduduwa's daughter), Alaketu of Ketu (son of a princess), Oba of Benin, Oragun of Ila, Onisabe of Sabe, Olupopo of Popo, and Oranyan of Oyo. Each of them made a mark in the subsequent urbanization and consolidation of Yoruba confederacy of kingdoms, with each kingdom tracing its origin to Ile-Ife. After the dispersal, the aborigines, the Igbo, became difficult, and constituted a serious threat to the survival of Ife. Thought to be survivors of the old occupants of the land before the arrival of Oduduwa, these people now turned themselves into marauders. They would come to town in costumes made of raffia with terrible and fearsome appearances, and the Ife people would flee. Then the Igbo would burn down houses and loot the markets. Then came Moremi on the scene-like Deborah of the Old Testament. When no man could dare the Igbos, Moremi asked the Esinminrin river for help and promised to give offerings if she could save her people. The orisa told her to allow herself to be captured and to understudy the Igbo people. She did, and discovered that these were not spirits; only people with raffia for dress. She escaped, and taught her people the trick. The next time that Igbo people came, they were roundly defeated. Moremi then had to go back to Esinminrin to thank the gods. Every offering she offered was refused. On divination, she was told she had to give Oluorogbo, her only son. She did. The lesson of Moremi is the lesson of patriotism and selflessness. The reward may not be reaped in one's life time. Moremi passed on and became a member of the Yoruba pantheon . The Edi festival celebrates the defeat of the Igbo and the sacrifice of Oluorogbo till today. 3. The Oranmiyan Adventures, Afonja Treachery, Internal Division, Enslavement and the Fall of the Nation. Oranmiyan was the last of the Oduduwa offsprings. But he was the most adventurous and the founder of Oyo Kingdom. On some accounts, he was the third ruler of Ife as successor to Oduduwa. But he later decided to avenge the expulsion of his father from the East, and so, he led an expedition. After many years on the road, and as a result of disagreement between him and his people, he could not go further. Feeling too ashamed to go back, he appealed to the King of Nupe for a land to found his kingdom. He was obliged, and that land became the nucleus of Old Oyo Kingdom. Oranmiyan, taking the title of Alafin, succeeded in raising a very strong military and effectively expanded his kingdom. His successors, including Sango, the mythical god of thunder, Aganju and Oluasho were also as strong. Peace and tranquility prevailed during the reign of Abiodun, though it also experienced the decline of the army. (SONG). Awole Arogangan was Abiodun' s successor and it was during his reign that trouble started for the kingdom. He was forced to commit suicide; but before his death he was said to have pronounced a curse on all Yoruba, that they will not unite and that they will be taken captives. Afonja was the Kakanfo, the generalsimo of the Army, in the northern Yoruba town of Ilorin, during the reign of Awole and his successor. Afonja refused to recognize the new king, and invited the Fulani who were then leading a jihad to the south, to assist him against the king. They did, but he did not survive himself, because the Fulani, after helping him defeat the Alafin also turned against him. They fired numerous arrows at him and his dead body was stood erect on those arrows as they stuck into his body. The treachery of Afonja marked the beginning of the end of the Oyo empire and with it the decline of the Yoruba nation. Civil war erupted among the various Yoruba kingdoms: Oyo, Ijesa, Ekiti, Ijaiye, Abeokuta and Ibadan. As this was going on, Dahomey on the west and the Borgu on the north were also posing trouble for the Yoruba kingdoms until the intervention of the British and the imposition of colonial rule. Those who argue that there was no consciousness of a common Yoruba identity until the 19th century may be referring to these civil war episodes in the life of the nation. But they forget that these people, in spite of the civil war, share a sense of common origin and common language. And it is to be noted that the so-called peace that was imposed by the British could not have lasted had there not been a sense of consciousness of coming from a common origin. The Face of the Sahara.